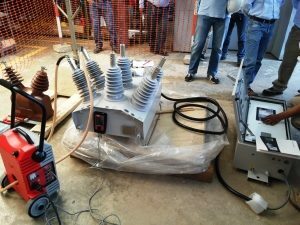 The automatic circuit recloser (ACR) or autorecloser is a main protection element in medium voltage distribution lines that provide power restoration automatically and minimize network outage time. The automatic recloser has two main components, the circuit breaker and the control unit, which are housed separately and connected through a control cable. The recloser is usually pole-mounted, with the breaker and protection CTs located in the top of the pole to switch the overhead line; the control unit is located at the bottom of the pole in a control box which contains the relay controller and batteries. In case of a network fault, the recloser opens and recloses several times, clearing the fault – if it is transient – till lockout, if the fault is permanent. The automatic recloser operations are programmable in any combination of instantaneous and time-delayed trips, which can be optimized to coordinate with other protection elements in the network. The correct operation of installed reclosers is essential for keeping reliable customer service. The recloser must perform the open/close functions reliably and according its programming. Therefore, the recloser testing ensures faulty reclosers are detected early, before problems are experienced. Usually, site testing of the recloser is performed before placing them in service, and also during the periodic scheduled maintenance. The most effective and quickest way to check the automatic recloser functionality is through primary injection, simulating the high current fault, and verifying the timing of all operations till lockout. If the recloser does not complete its complete sequence, for whatever reason, or not in the expected timing, further checking can be required. This involves the recloser testing of the whole system, a functional test, not only to test the breaker or to test only the recloser control. The Raptor system provides a simple and quick way to perform recloser testing, checking the entire system, without requiring skilled staff or any configuration. 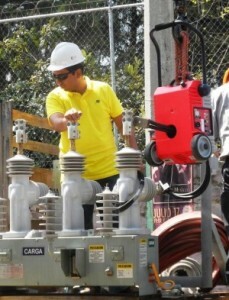 With the Raptor, the operator needs only two connections to test the automatic recloser, just to connect the two test leads from the pass-through Raptor generator to the recloser pole. Through the high current fault simulation, the Raptor performs an automatic test, detecting and measuring the opening and reclosing times, the number of operations, and the total clearing time, of the automatic recloser under test. The automatic test of the Raptor provides a simple way to perform a functional test of these important devices. This involves, under simulated fault conditions, the operation of the protective relays and circuit breakers, verifying the number and sequence of operations of the recloser until lockout. This primary injection testing of the automatic recloser, makes a reliable diagnostic of the recloser status and is quicker and easier than the test performed through a secondary injection in the electronic control, enabling to check the entire system, including the breaker, CTs, relays, control cables and wiring. The small size and weight of the Raptor facilitates the onsite testing of reclosers, even those mounted on the pole, or before it is put into service, as well as laboratory or factory testing. It is also possible to program the total test time to adapt to the different sequence times of the recloser. The primary injection testing of automatic reclosers was lacking of a system which provided the high, accurate, and steady current required for this application, and that were really portable to facilitate the testing required. The old systems were of big size and weight, without accurate test process, no automatic current control, no storage and reporting, and a limited user choice. All these drawbacks have been solved with the Raptor System, which makes primary testing easier, faster and more convenient. The Raptor provides accurate and stable injection of high current, DSP regulated, with accurate control of timing and amplitude; the easy to use handheld control, that includes reporting and Test Templates facilities, simplifies and reduces the testing time. Furthermore, this system will not become obsolete, free software updates via internet are provided, and new applications required by the market demands can be programmed to enable additional functionality. Significantly reduces requirements for qualification of staff, not being required an experienced test engineer. 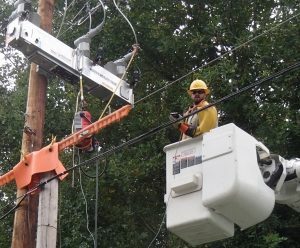 Reduces training sessions for current utility maintenance crew. Mistakes in the process are practically excluded. Simple procedure for protection settings testing. Fast processing of the results and recall of stored data for immediate or later analysis. Smaller and lighter than any other system, providing the portability that the application requires, and facilitates field testing (getting closer to the recloser). Modern and accurate technology at a reasonable price. For more information, please check the related SMC products or contact SMC.